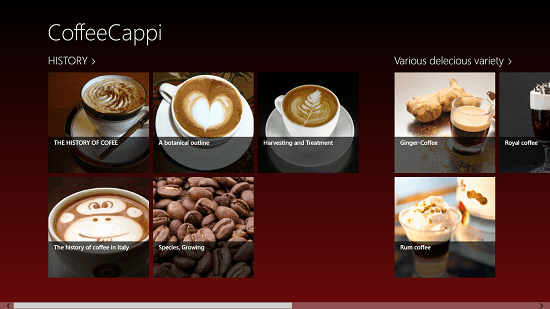 CoffeeCappi is a free coffee recipe app for Windows 8 and 8.1 devices. The app is a great app for the connoisseurs of good coffee all over the world. When you launch the app on your device, you will be presented with a tiled interface, which allows you to read through the history of coffee or allows you to read through a lot of coffee recipes which are available in the app itself. The app’s main interface is very uncluttered and allows you to easily access the various informative tiles in the app even when offline. Each tile contains data which is opened up in an appropriate reader interface on a new screen. 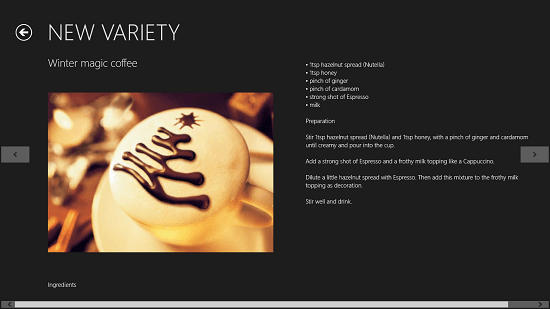 CoffeeCappi is available for free from the Windows App Store. When you run the app on your device, you will be presented with an interface as shown below. In the above screen, you can see that you are presented with a lot of tiles, which allow you to access information about various types of coffee. The app makes for a good download for coffee lovers all over the world. From the above interface, you can choose to access information related to coffee and you can also access various coffee recipes on your device by clicking on the same from the tiles listed under various delicious variety. 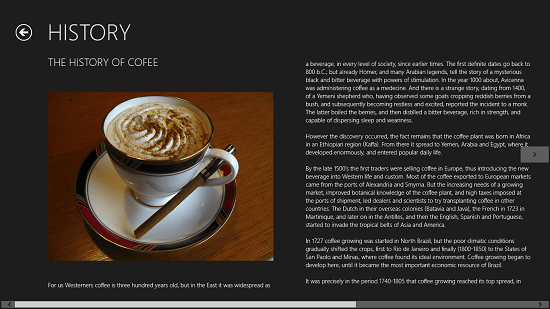 In the screenshot below, you can see that I have selected a tile which allows me to read the history of coffee. You can return to the main screen of the app by clicking on the back arrow button at the top left corner of the screen. In the main interface, you can also choose to read the recipes of various types of coffee by clicking on their respective tiles. As you can see below, I have the recipe of one type of coffee open in the screenshot below. You can switch between recipes by using the arrow buttons on either side of the screen. These arrow buttons are present at the center of the screen on either side, as can be seen above. The app can also be snapped to either side of the screen if you wish to multitask. This winds up the main features of CoffeeCappi for Windows 8 and 8.1. CoffeeCappi is a great app to know more about coffee and learn new coffee recipes. The app can be downloaded for free from the link below.